Custom Themes addon for Styles and Layouts for Gravity Forms plugin lets you save your own themes. Once you have designed a form then you can save it as a theme and apply on other forms. This will save a lot of time and hassle for those who have multiple forms in their website and need consistent design for all their forms. Every purchase get updates for one year. You will need to renew your licence key after one year to keep getting updates. 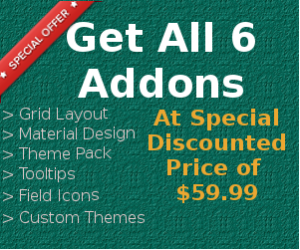 The addon will work even if you don’t renew your license. Renewal licences have 30% discount from purchase price.